Target Doubles Down on LGBT Agenda—Lesson Not Learned? The Minneapolis-based Target Corporation had quite the tumultuous year in 2016. And 2017 isn’t panning out any better. Recent headlines show Target keeps hitting its own bull’s-eye with self-destructive policies. The retail giant has been dealing with a huge financial blow-back since it announced its transgender bathroom and changing room policies last spring. Despite backlash against these policies, the company has doubled down in support of the LGBT agenda. Target has recently resuscitated its LGBT pride campaign, which has prompted critics of the retailer’s policies to argue that the company has learned nothing from the nationwide backlash spurred by its aggressive promotion of LGBT activism. Critics argue Target should remain neutral on culture war issues and save itself from self-inflicted wounds. In February, Target abruptly shuttered expansion plans for two major projects. Did the boycott play a role in this decision? Target announced the end of two projects as the stock price hit $64.77 at market close on Feb. 8. 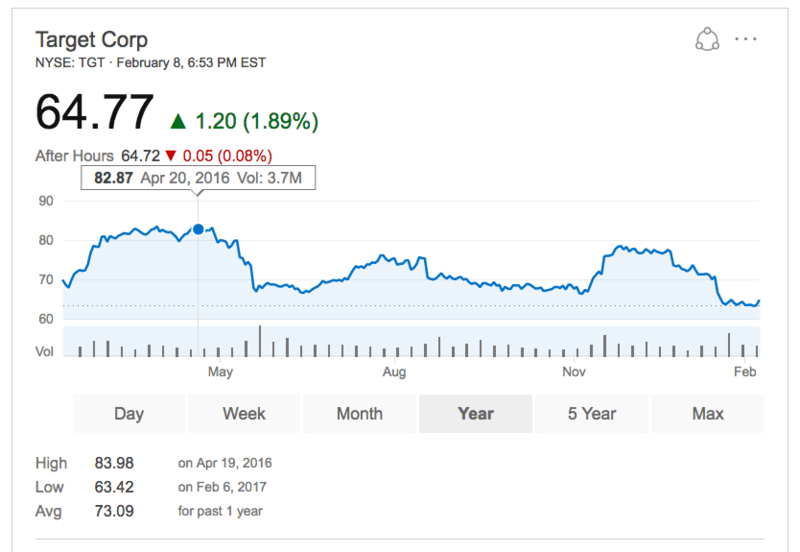 That’s down from $83 when the boycott began once the company made its transgender policy change on April 19 . The stock price drop has slashed roughly $10 billion from the company’s value on Wall Street. Target dismissed the losses and wrote off the project shutdown as a normal “ebb and flow” of running a business. At Target, we regularly pause to evaluate our business and have to make tough choices about where our company is best served to invest our time and resources. We recently made some changes to the innovation portfolio to refocus our efforts on supporting our core business, both in stores and online, and delivering against our strategic priorities. Target remains absolutely committed to pursuing what’s next. We see a tremendous opportunity to drive innovation in areas that will fuel our growth both in the short and long-term in areas such as digital, technology, supply chain and merchandising. Leadership problems and stockholder concerns have also added to Target’s woes. At the beginning of this month, Fortune reported Target Corp. CEO Brian Cornell “took a sharp cut in compensation after the company failed to meet financial goals in a year marred by declines in sales and share price.” Cornell’s cash-and-stock compensation relies on the company hitting sales and stock price targets. It missed the sales mark by $2.13 billion and its incentive EBIT (earnings before interest and taxes) goal by $623 million. On Sunday, MarketWatch released the 10 best and 10 worst U.S. stocks of 2017. Target Corp. made the list of worst returns this year. So, where does Target go from here? Will the downward spiral continue? If the company wants to win back once loyal consumers, it needs to break free from the politicization of shopping. Or maybe it doesn’t, and consumers will just continue to take their business elsewhere.